Last week was El Día del Niño at Ramsey Park in Watsonville, CA. This is an annual event to celebrate Earth Day. Karina and I, as well as our supervisor Amanda, participated in the event by setting up a table that included information about the Elkhorn Slough Reserve. We also had a very fun board game for kids and also adults to participate in. The game included different animal species as well different habitats in picture cards that needed to be coordinated with each species and its habitat. In the event there was also a lot of different outreach tables from different organizations that provided very informative information for kids and adults to enjoy. The surveys have been going good with a large mixture of shorebirds from Sandpipers to Plovers and Willets. I am starting to see fewer numbers though as the shorebirds are leaving our survey areas to other places. It seems like the last couple of weeks the shorebirds were just here in large numbers, but that has changed really rapidly. More and more shorebirds are arriving by large numbers to the Elkhorn Slough Reserve and to a couple other of our survey locations. Jerry Road is one of my favorites because its where we are able to see a bigger diversity of shorebirds from Black-bellied Plovers to Whimbrels. This week my fellow survey partner and I had a special opportunity to meet with Carleton–he is an avian ecologist with Point Blue Conservation Science. We had the chance to survey Snowy Plover nests and Karina was able to locate one all by herself as we were walking on a gravel path. Snowy Plovers like to nest on gravel paths because their eggs resemble that of a Snowy Plovers egg which helps it camouflage from predators. Also this last Wednesday Karina and I attended a community outreach event that took place at my local gym in Salinas, CA called ‘In’Shape’. 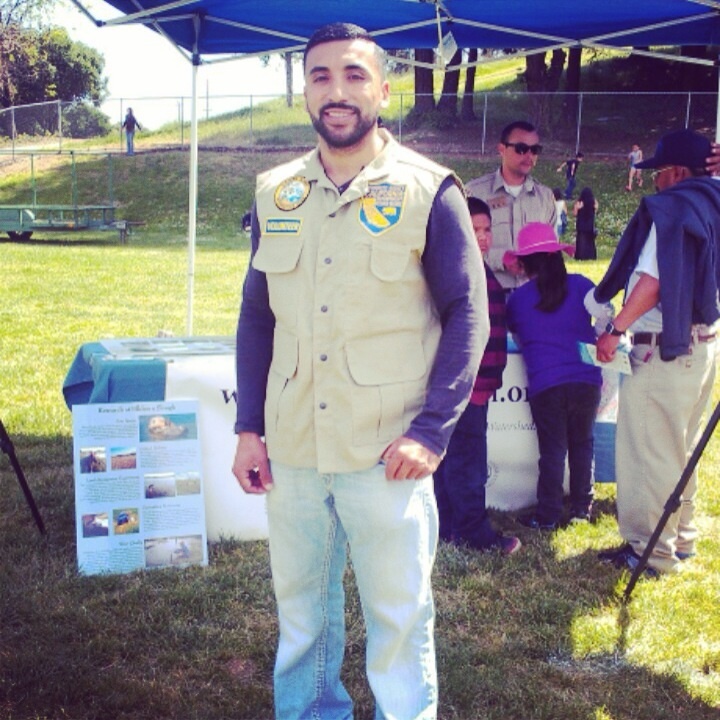 We took this opportunity to reach out to the public about the Elkhorn Slough Reserve and briefly discussed what Environment For The Americas is. Some of the people didn’t even have an idea that the Elkhorn Slough Reserve existed so it was a really good feeling to see people exited about going to meet a new location where they can take their families to and enjoy a educational walk through the reserve.